Link quality indicators (LQI) are proprietary numbers that give an indication of how good a communication channel is for transmission and correct reception of signals. Most of the existing LQI’s however are unable to discriminate between a noisy channel and a hostile jammer because they are based on energy profile of the received signal. Consider a friendly sensor, Alice, and an eavesdropper Bob all sending messages to a receiver with Bob having ulterior motives to flood the channel and disrupt communication. Figure 1 illustrates a typical channel jamming setup. 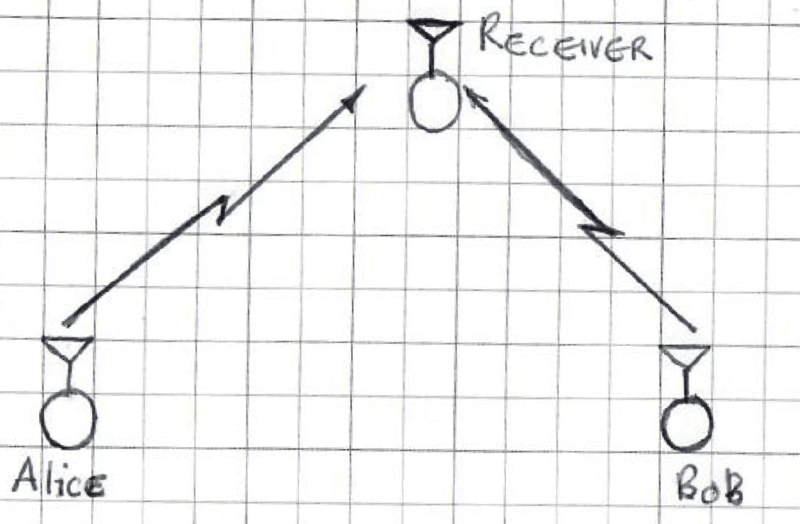 Figure 1: Alice transmitting to receiver with a jamming signal from Bob. (i) An energy detection threshold T1 is applied to determine whether a packet was present or not. (ii) If a packet was present, the matched filter output is computed and compared to the previous value from the preceding epoch. The ratio is then compared to a threshold T2 (iii) If steps (i) and (ii) are passed, then, a Pearsons correlation coefficient is computed and compared to a final threshold T3. The implementation at the receiver node is illustrated in Figure 2. Figure 2: Signal processing blocks at the receiver node. The algorithm described leads to detecting whether a packet was transmitted and from which source up to signal-to-noise-plus-interference values well below 0dB.